For the past couple of days, I've felt as if I've been living in one of those "If You Give a Mouse a Cookie" books. 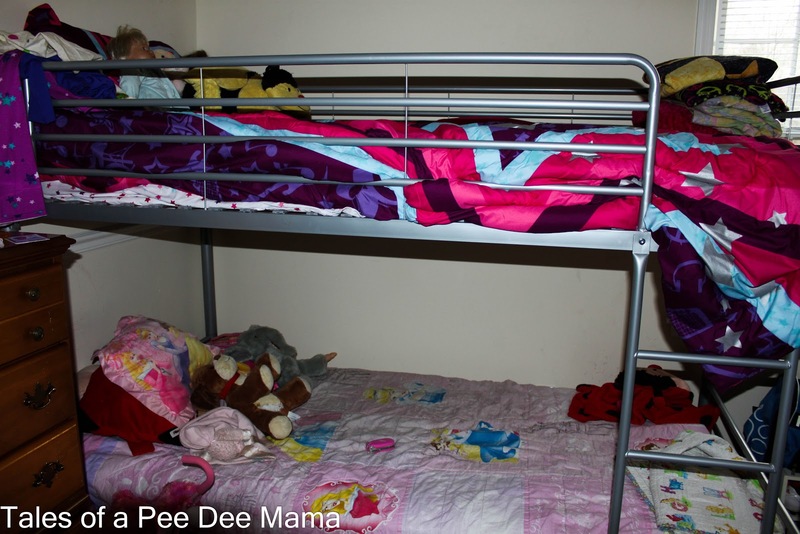 For Christmas, we gave Soccer Girl and Sassy Pants a set of bunk beds. Soccer Girl had asked for new bed stuff, meaning new sheets since she still had Dora sheets on her bed. Sassy Pants was still in her toddler bed, so Robb and I figured we'd go ahead and get them a bunk bed since 2 twin beds wouldn't fit in their room. We also got Soccer Girl a new bed set, and Sassy became the proud owner of Dora sheets and a Disney princess comforter. 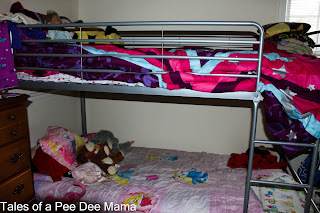 We set the bunk bed up Christmas afternoon and discovered that there was a lot more space in the room, so we decided to move the dresser, that housed all of the older girls' winter clothes, from the hallway into the bedroom. Those clothes piled on the top are the next size up for Sassy Pants. Whew! 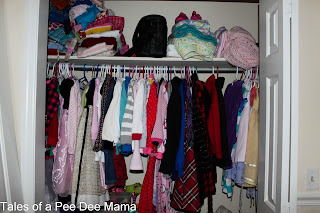 These four girls have a TON of clothes! If you give your girls a bunk bed, then you will need to rearrange their room. When you rearrange their room, you will move an additional dresser into that room. 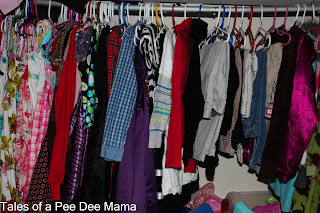 When you move the dresser, you will need to reorganize the clothes. 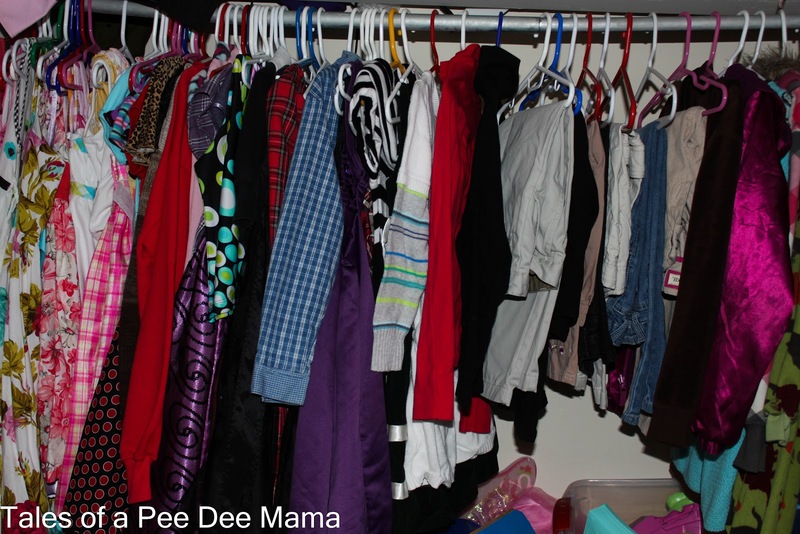 When you reorganize the clothes, you will need to organize the closet. 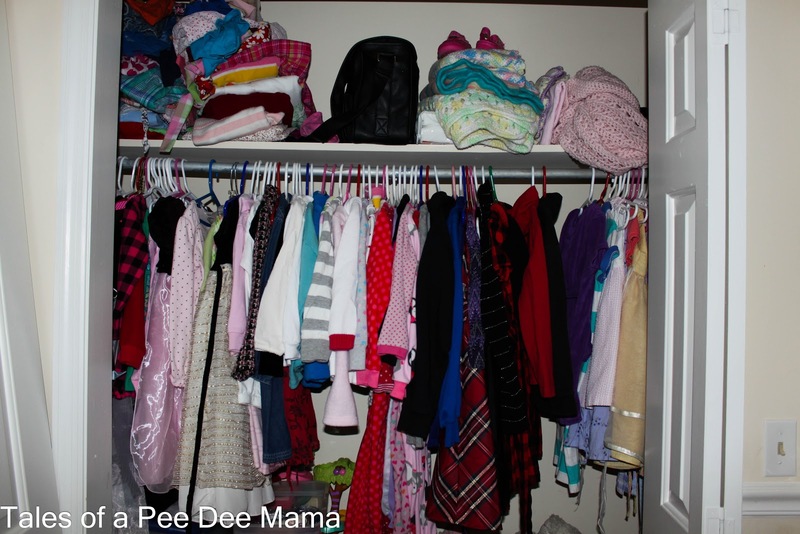 When you organize one room's clothes and closet, you will then need to organize the other girls' room's clothes and closet. When you've finished organizing 2 bedrooms' (4 girls) worth of clothes, you will be exhausted, and your wonderful husband will offer to take you out to dinner! !